The King had a great Royal hunt in the area called Hatfield Chace, and in the reign of Charles I, Cornelius Vermuyden a Dutchman, was granted the opportunity to drain Hatfield Levels (Chase), to be successful this would also have to involve the draining the adjoining Manors of Wroot, Finningley, Misterton and on the Commons in the Isle of Axholme. In 1626 Vermuyden entered into an agreement with Charles I to the effect that, Vermuyden at his own expense, should drain the whole of the Chase and the adjoining flooded land. In return for this he, along with the King and the tenants of the adjoining land would each receive one third of the land that was drained. The Isle at this time was surrounded by water, the River Trent to the East, R. Dun(Don) to the North, Rivers Idle and Torn to the West, and the Idle also to the South, These rivers meandered freely and constantly changes their beds. 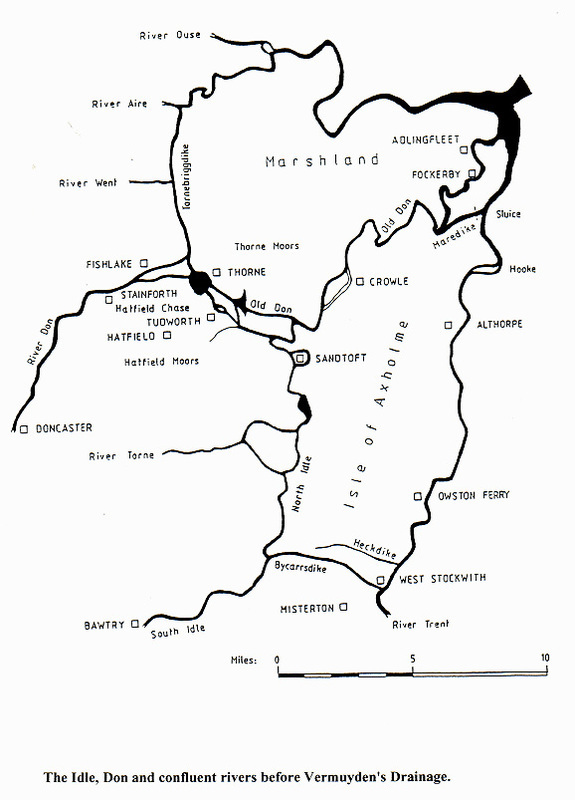 In the winter much of the land would be flooded, quite large boats could sail between Wroot and Haxey Carr and the R. Trent, parts of the Isle were inaccessible without a boat. The low-lying water covered areas were rich in fish and water fowl, which were important sources of food and income for the local inhabitants. Between Hatfield, Wroot and Westwoodside there was about three feet of water all year round. There was probably about sixty thousand acres of land flooded at certain times of the year. In summer the land was flooded to a lesser degree and there was sufficient dry land for common pasture, which was protected by the 1359 deed of Roger de Mowbray. Or so the local inhabitants thought. Some attempts had already been made at drainage, in the reign of Edward III (1327 - 1377) commissioners were set up to build and maintain a channel to relieve the water of the Idle. Bykersdyke was dug from the R. Idle to W. Stockwith to achieve this. In the reign of Henry V (1413 - 1422) the commissioners had Mare Dyke cut and a sluice constructed at Luddington to try to control the waters of the R. Dun (Don). Snow sewer and Hekdyke are also pre Vermuyden attempts at drainage. The original grant for drainage was solely to Vermuyden but to raise capital he sold shares in the enterprise to several of his countrymen who became known as Participants. These participants were mainly very rich ,of noble extraction and lived in Holland but some came over and took an active part in the operation. Drainage was started in 1627 and according to Vermuyden was completed in 1629, he imported Dutch labour to carry out the work, it is uncertain how many came over but there were at least fifty initially. There camp was set up at Sandtoft where Vermuyden had a house. The original drainage plan seems to have been as follows: The R. Idle was stopped at Idle Stop and the water directed down Bykersdyke to the R. Trent at W. Stockwith. The North West branch of the R. Don cut at Snaith and a five and a half mile drain called Dutch River was cut to Goole, the R. Torn was restricted into the new R. Torn. The river channel from near Wroot was to come out at Althorpe into the R. Trent. A new drain was cut from Idle Stop due north, crossing the R. Torn at Tunnel Pits as far as Dirtness. From there it ran parallel to a similar drain from Tudworth due West to the R. Trent at Althorpe. High embankments were built on the right hand side of the R. Don and on the North bank of Bykersdyke. The work is estimated to have cost between three and four hundred thousand pounds. The drainage was only partially successful as Vermuyden had made some fundamental mistakes. He took two drains and the new R. Torne to Althorpe instead of following the natural lie of the land to Adlingfleet which is approx four feet lower. ﻿In the case of the new R. Torne he merely raised the banks on the surface of the land to contain the river instead of excavating hard rock. The lands round Hatfield and Thorne were fairly effectively drained but at the expense of flooding on adjoining land which had previously never flooded. High embanking on the right hand side of the R. Don protected the East side but the land on the West side around Snaith, Stainforth, Pollington. Sykehouse and Fishlake was flooded and prior to drainage were unaffected by flooding. The waters of the new R. Torne proved to be too much for the embankments and much of the land west of Epworth was heavily flooded. The most successful drain was from Tudworth to Althorpe because it carried no water from a river. ​As can be imagined opposition to the drainage was very extensive by the locals who claimed with some justification that their common lands were being taken away despite Mowbrays Deed, the Isleonians would also lose their fishing and wildfowling, for which they did receive four hundred pounds compensation. They also complained that in the distribution of the land they were only offered the lowest and therefore the wettest land. A Commission of Sewers was set up to deal with grievances on both sides, the Participants were compelled to make some improvements. The work of drainage continued despite the protests and eventually led to violence between the workforce and local inhabitants. Dutch workmen were assaulted, their carts and barrows were burnt. It is said an embankment near Haxey was broken down no less than fifty times. The workmen of Sir Philibert Vernatti, one of the participants, were thrown into the drains and mock gallows were set up to frighten them. The damage to the drains along with unforeseen difficulties and the improvements needed left the participants with little or no reward for their investment. In 1636 the Commoners of Epworth complained to the local Commissioners about their allocation of only six thousand acres. The dispute was referred to the Attorney General, Sir John Banks, who gave them one thousand acres more out of land previously allotted to the Participants. This did not satisfy the Commoners who, under Mowbrays Deed, claimed all thirteen thousand acres as theirs by right. More violence resulted which led to four Epworth Commoners, William Torksey, Hezekiah Brown, John Moody and Henry Scott, having fines of one thousand pounds each imposed upon them at the Star Chamber in London, they also had to make a payment in respect of damage to Vermuyden of one thousand marks. It appears that these and more fines were never paid after various crooked dealings with an agent of Vermuyden. After this there was relative peace between the parties for a few years, until the outbreak of Civil War in 1642, The Isleonians looked upon this as an opportunity to rid themselves of the Participants, they sided with the Parliamentarians due to the fact that they looked upon on the drainage as having royal participation and patronage.